Brianna Wu is a video game developer running for Congress in Massachusetts' 8th District. Like many people, she took to Twitter on Sunday following the controversy surrounding United Airline's decision to prevent two young girls from boarding a flight because they were wearing leggings. United justified the strict dress code enforcement because the fliers were United pass travelers and were subject to a different set of rules. Why? Because they're dependents of United Employees, or United Employees themselves, who can board planes for free on a stand-by basis. Wu was one of many that threatened to boycott the company following the controversy. But some of her followers defended the airline, including pilot Quincy Fleming who pointed out that most airlines enforce strict dress codes on people travelling for free. Wu responded to Fleming in tweets that have since been deleted. Pro Publica's tweet archiving website Politiwoops archived the exchange. The problem with Wu's accusation of mansplaining? Fleming is a woman. Fleming wrote in further tweets that Wu has since blocked her. People were pretty amused by the screw up. 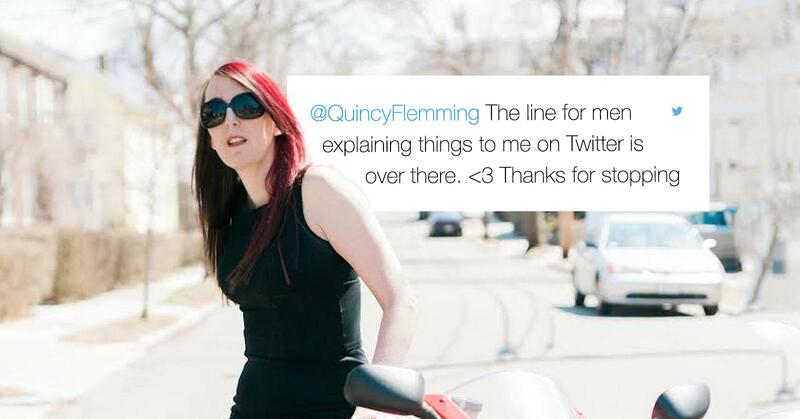 @HashtagGriswold I wonder if @Spacekatgal legs are tired from all of the conclusions she jumped to in responding to @QuincyFleming. It is freaking hilarious. I'm not exactly a poster child for the right here. This seems like an honest mistake, but you do have to admit, it's hilarious. "We care about the way we present ourselves to you, our customers, as we believe that is part of the experience on board our flights. One of the benefits of working for an airline is that our employees are able to travel the world. Even better, they can extend this privilege to a select number of what we call 'pass riders.' These are relatives or friends who also receive the benefit of free or heavily discounted air travel — on our airline as well as on airlines around the world where we have mutual agreements in place for employees and pass riders.